Whether you want a new surround sound system, LCD television, or even your own movie theater, we’ll work with great care to assure your satisfaction. 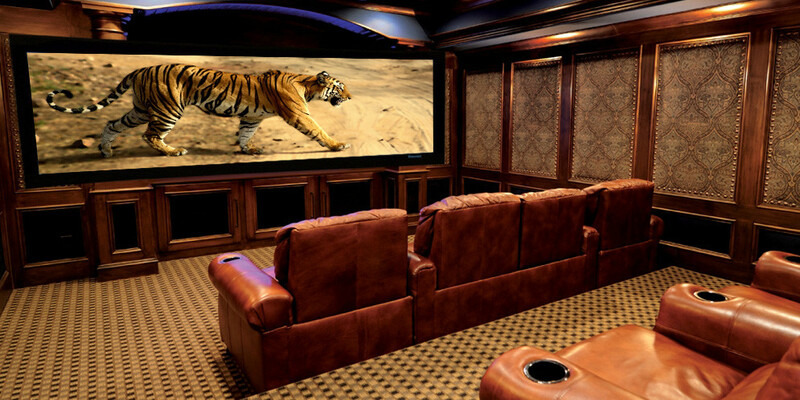 A luxurious home theater system can be crafted from your imagination. Today’s advanced technology can deliver a superior audio and video experience in your home entertainment center that in many respects surpasses large commercial cinema systems. Impressive new technological and design features include special acoustics, sound proofing, drape and light automation, multi channel audio, advanced universal remotes, custom theater carpet and luxurious theater seating. We work closely with our partner, industry leader AcousticSmart (http://www.acousticsmart.com), to provide you with an innovative home theater design and create media centers that can adapt to any space. Whether you are building a new home, remodeling a room or completing an unfinished basement, Dream Technologies Inc. and Acoustic Smart will work together to provide you with a first rate home theater experience. Your media center will provide high quality video and audio from all perspectives. Elegance is enhanced by concealing electronic components in cabinets and walls. Projectors can be hidden in specialized tables or bulkheads. Retractable projection screens can be stored overhead. Speakers can be flush mounted or retractable to blend into the walls and ceilings.